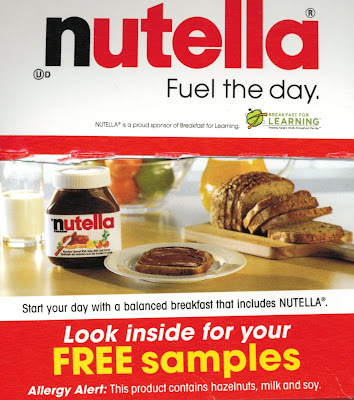 In case you missed it, Nutella USA is paying $3 million dollars to settle a class action lawsuit that was launched due to what the plaintiffs felt were advertisements that misled people into believing that Nutella, spreadable candy, was nutritious. Just had a quick peek at the Nutella Canada website. "Moms across Canada choose NUTELLA® as a part of their children's nutritious breakfast." I also learned that along with piggybacking on feel good charities like Breakfast for Learning, Nutella Canada healthwashes itself by supporting the Canadian Soccer Association, and tries to appear credible and health conscious by quoting the Canadian Pediatric Society on its website. Spreadable candy ought to be marketable as spreadable candy, no? Why resort to pretending it's healthy?